Election Commission issued Notification for the 3rd phase of Uttar Pradesh(UP) Assembly election today, setting in motion the filing of nominations. The third phase of Election will be held on 15th February which will decide the fate of three cabinet ministers, one minister of state, 29 sitting MLAs and 14 former ministers on 56 Seats in UP. "More than 1.75 crore voters are expected to cast their votes at 17,869 polling booths in 11,589 polling stations," Election Commission officials said. 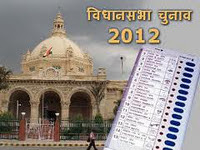 Some of Big names in UP Phase 3 election are Indrajit Saroj from Manjhanpur, Nand Gopal Gupta from Allahabad South, Dharmaraj Nishad from Shahganj, Rangnath Mishra from Mirzapur Sadar seat, Rakesh Dhar Tripathi from Handiya, Om Prakash Singh from Chunar, Kesari Nath Tripathi from Allahabad South, Shekhar Bahuguna from Phaphamau and Ujjwal Rama Singh from Karchan etc.